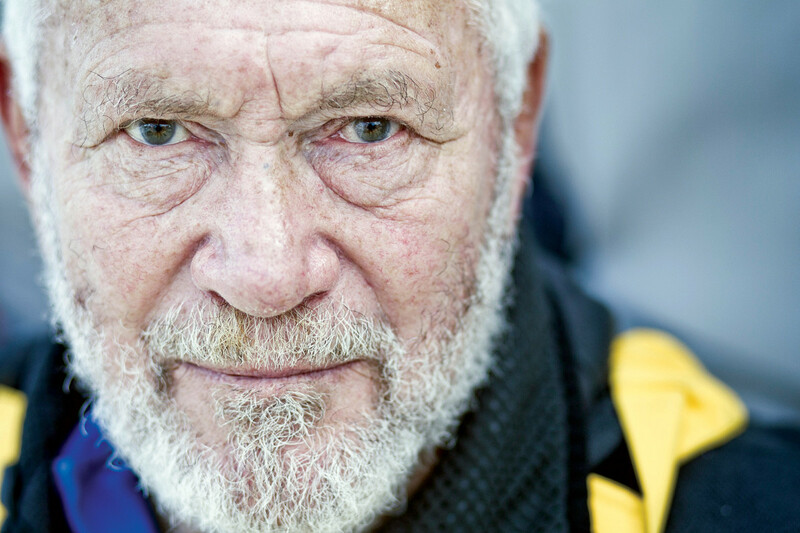 Winner of the first-ever round-the-world yacht race, the 1968-69 Golden Globe, on his 32ft teak sloop Suhaili, Sir Robin Knox-Johnston is one of the greatest living sailors. In the years following that solo epic, Knox-Johnston and fellow legend Sir Peter Blake set a Jules Verne Trophy record for the fastest ever crewed circumnavigation, Knox-Johnston started the successful Clipper Round the World Race for amateur sailors, and he crossed oceans using only long-forgotten navigational techniques. Oh, and he raced an Open 60 alone around the world at the age of 68. Andy Schell caught up with Sir Robin at a recent boat show. You made a name for yourself being the first person to sail around the world, but there was life before that. How did you get started? Were you from a sailing family? There was sailing on my mother’s side, but on my father’s side, no. They were farmers in Northern Ireland. From the age of eight I wanted to go to sea. And at 17 I decided I’d had enough of school and joined the merchant marine. I had to sign on for a four-year apprenticeship. I thoroughly enjoyed it, but I was always interested in sailing, and as part of the apprenticeship we had to learn to sail. In those days, the lifeboats had masts and sails, so if the ship sank, you could sail yourself to the nearest port. When did you decide you were going to have your own boat and go on these big adventures? We were based in Bombay, so we could go sailing with the Bombay Yacht Club and borrow their boats. Near the end of the contract, I thought it would be fun to build a boat and sail it home. So that’s what we did. I sailed Suhaili home with my brother and a friend. What inspired you to embark on long-distance sailing voyages? I had a job as the captain of a ship running up and down the southeast coast. That’s when [Sir Francis] Chichester went past on his voyage around the world, and I began to think about it. Then I saw him come up the Thames, and I thought, there’s one thing left to do. Let’s go around without stopping. In the middle of getting ready for the trip, they announced a race that the Sunday Times was organizing. There were four of us at the time. And that number slowly grew to nine. It was to be a round-the-world, non-stop race. The rules were pretty slack. There was no checking on our ability or anything. They decided the race would start in October. I told them that I wouldn’t be able to wait that long. “I’ve got to get around Cape Horn early January.” You don’t want to go around Cape Horn in the winter. It’s a nasty place. I told them I was interested in being the first to do it, and not in winning their race. They ended up changing the rules so that you could leave anytime between June 1 and October 31. I left on June 14. What was it like, doing the Golden Globe? I wanted to get going. I was ready to go. Unfortunately, I had a bit of an attack of hepatitis. It was just before I left, so for the first month I was nursing myself a bit. I wasn’t very fast. After two months I lost the radio, so I had no way of knowing what was going on until I got to New Zealand. I was pretty certain I was in the lead, but I didn’t know by how much. I was at least four weeks ahead of [Bernard] Moitessier, and three weeks ahead of him by Cape Horn, so he hadn’t gained much. And he wasn’t going to catch me if I kept on. But I didn’t know that at Cape Horn. It wasn’t until I got about a week from home I learned he was in the Indian Ocean, and that he wasn’t finishing. Do you have a romantic notion of ocean sailing? Do you enjoy the peace and solitude? Or is it about the challenge? I don’t look at it as a romance. I enjoy being out there. I enjoy being on my own sometimes, and I enjoy sailing with a crew. Sometimes it’s just me and the boat and we’re just going from here to there. It’s my choice. I’m making the decisions here, not some civil servant. And I enjoy that freedom. Did you think you could use the Golden Globe experience as momentum for later projects, or was it just to have done it? Just to have done it. I was going to go back to the merchant navy. That’s what I liked doing, that’s what I’m trained to do. I’m good at it. Unfortunately, the merchant company got taken over, so I started building marinas and running a boatyard. It was quite fun. I went racing from time to time. I always saw it as my hobby. Is that where your true passion was? I absolutely love racing. But I enjoy business. I really enjoy the Clipper race, that’s something that we’ve taken 5,000 people out on now over 20 years. Forty percent have never been on a boat before. They become really good seamen. I think it’s a combination of Clipper Ventures and the Golden Globe Race. One of the two. What we’ve achieved with the Clipper I think is pretty fantastic. What was the inspiration for that idea? I was climbing with Chris Bonington, a well-known British climber, and he was talking about what it cost to climb Mount Everest. I wondered about the sailing equivalent. How much I would have to charge if I supplied the boats, the skipper, training, clothing, food, ports and everything else. And I came to the conclusion it was just over half of what it costs to climb Mount Everest. So, we put an advert in the newspapers and got 8,000 answers. We started interviewing and building boats. I built eight boats, identical 60-footers. Rushed off, arranged the route, and eight months later the first race started. It was quite a busy year. You do a lot for youth sailing. Where do you want the industry to go? 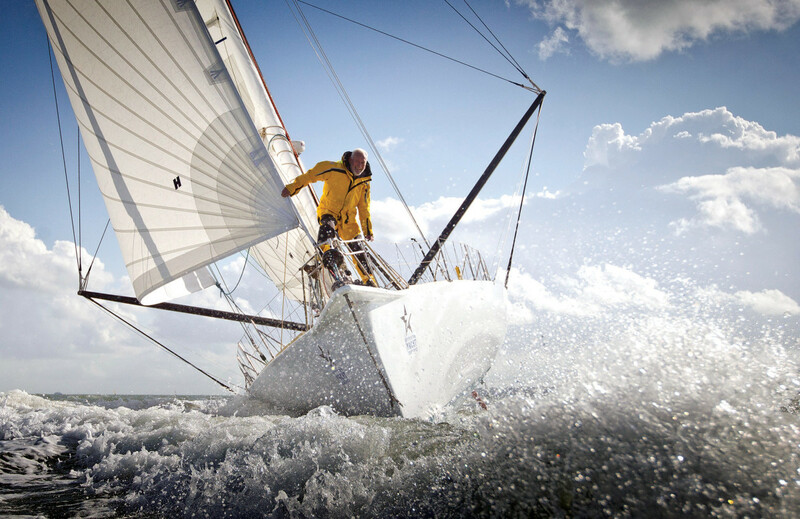 I would like sailing to be on the school curriculum, in every school, in one form or another. It could be one day a week, or it could be doing a tall ships race. You make kids realize they’re capable of more than they thought. I think it helps shape them and gives them confidence. You sailed to America with an astrolabe. Can you describe what an astrolabe is? And what motivated you to try that? It goes back to the Ancient Greeks. It’s basically a circle with a lever called an alidade pinned to the middle, and you turn it round until it lines up with the sun, and then you can read off the angle of the sun. It will work out a latitude for you, provided you know the movement of the sun. I was curious as to how well you can navigate with an astrolabe. Considering a degree of 60 miles is about a millimeter, you can gauge it pretty accurately. And by depriving myself of anything else and just using that, I forced myself to discover things about using it which I’d never have found if I sat at a desk. Things like blackening the reflective service with candle smoke so that the little pillar of light would show up much better. People have tried using an astrolabe, but not practically, on a voyage. I sailed Suhaili from the Canary Islands to San Salvador. I was alone. It took me 35 days, 100 miles a day. Same as Columbus, roughly. I was already interested in navigation techniques, from medieval times to the Phoenicians, even back to the Vikings. They found Newfoundland with a sun compass, 500 years before Columbus. I did it out of pure curiosity. I wondered what instruments were they using and how they used them. Once I started asking questions, I realized there was no one who’d done it. I decided I was going to go and find out. You sailed the Jules Verne with Sir Peter Blake. What was it like sailing with him? Peter first sailed with me in 1971 in the Cape Rio race. And then he was my mate in the Whitbread in 1977. We were both on the Whitbread committee when we heard about the Jules Verne (Jules Verne Trophy for the fastest circumnavigation of the world). We decided to team up and do it. We wanted to beat 80 days. We thought it was possible. Everyone told us it wasn’t. We bought a big catamaran and we completely refitted it and off we went. Unfortunately, we hit something. Had to pull out. And then our sponsors asked if we would like to do it again, so off we went. It was good sailing with Peter. He was a very, very good organizer and a good motivator. I tend to come up with my own ideas. I wouldn’t say they’re always all mine. It can well be that I heard someone say something. But I tend not be with a crowd when I’m making those decisions. It’s usually me. I’ll go away and think about it. If I think I can do it, then I do it. Just get on with it. History. Particularly maritime history. I’m very interested in that. It absolutely fascinates me. Do you buy into the old maritime superstitions? Some. I don’t like sailing on a Friday the 13th. Other Fridays are OK. I don’t believe in the Bermuda Triangle, that’s a bunch of rubbish. Do you still have that feeling of apprehension? Oh yeah, less now because I’ve got more experience. But even so, my mind races with, “Have I thought of this? Have I thought of everything? What have I forgotten?” A little bit of apprehension before you set off isn’t a bad thing. It’s usually a bit late. When a wave is coming towards you and it’s 80ft high and stretching from horizon to horizon, breaking at the top, what can you say? Why did I decide to do this? You’re not going to get away from it. It’s going to hit you. And all you can do is hope you’ve got the boat safe so she’ll probably be swept but she won’t be rolled. It depends on how you handle the boat. Do you think that when you have a dramatic incident, and people snap, that’s something you’ve learned or you’re born with? I do believe we’re born with different attributes, but I don’t believe that you can’t train them. I think that when things go wrong, if the leadership is strong, clear and firm, the crew immediately feels that someone is in charge. You need people who’ve got experience and are able to provide that leadership. That isn’t necessarily born into you. That’s something you learn with experience.